Forty-plus years on, Afro-beat master Orlando Julius is still gettin' it done. 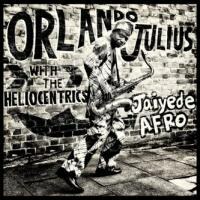 Orlando Julius has been making a joyful noise for a long time now, and his latest full-length, Jaiyede Afro, brings the gladdest of tidings: the man is still Afro-rocking with as much intensity and verve as ever. A contemporary of the great Fela Kuti, Orlando plows a similar furrow, with a good deal less emphasis on horns but plenty of guitars, organ, and uptempo percussion to keep things moving. Especially notable are the band’s fluid and irresistible basslines, which propels the whole band effortlessly and provides a sinewy backbone for the rest of the band to build upon. The result is a meaty, high-energy gumbo that is compulsively danceable, but also complex to immerse oneself in and simply listen to. Great for road trips too. In case it’s not clear: Jaiyede Afro is a tremendous album. The good times start right away, with joyous album opener “Buje Buje”. Over layers of skronking horns, sweet guitar trills and thrumming bass ‘n’ drums, Julius’s voice exhorts the listener with vocals that are passionate but never strident. The hypnotic groove rolls on, engulfing the listener, and encompassing enough shifts in dynamic and rhythm to ensure that things never grow stale despite the lengthy running time. Follow-up tune “Love Thy Neighbor” is shorter, peppier, and instrumental, but every bit as engaging. The band is masterful at establishing an irresistible groove within just a few beats, and uses a wide array of sounds both organic and electronic to snare the listener’s attention. Julius is smart enough to allow these grooves, once established, to stretch out and breathe. The result is that many of these songs top the five-minute mark, with opener “Buje Buje” stretching past eight and epic “Be Counted” stretching well past 11. Another band might lose the plot with such extended workouts, but that is never the case here: With the rhythm section as reliable as it is, providing a rock-solid backbone that is never rigid or constricting, the rest of the instrumentalists and vocalists can soar. “Be Counted” features some freak-out sax howling and times calls to mind the more frenzied moments of the Stooges Fun House, but it never goes off the rails entirely due to the solidity of the rhythm section. With such a consistently compelling set it’s tough to pick a standout track, but “Sangodele” might be a contender, with its reverb-heavy wah-wah guitar line and propulsive bass. Another instrumental tune, it suffers not one bit from the lack of vocals. It’s unfair to single out just one song, though, as there are so many here that are so effortless (that word again) in their elastic, booty-shaking groove. “Love Thy Neighbor” in particular benefits from some nice organ flourishes, which add a crispness and sparkle to the sonic palette, while “In the Middle” utilizes many of the same elements, with a good amount of brass introduced into the mix, allowing Julius’s always-expressive saxophone to enjoy some company. Listeners seeking a rock-solid album of Afro-funk – or maybe a solidly rocking album of Afro-funk – need look no further than here. Orlando Julius has put decades of experience into this record, and it shows.